A shark attack, a starlet in hiding, a mysterious black box. 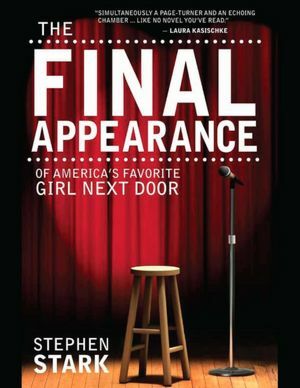 The opening pages of Stephen Stark’s The Final Appearance of America’s Favorite Girl Next Door have all the makings of a Hollywood page turner, but the novel’s style places the author in a far more literary league. The novel is a hefty one in terms of content as well as form. Weighing in at well over 600 pages (in 12 pt. Garamond, no less! ), The Final Appearance of America’s Favorite Girl Next Door touches on a wide range of topics — show business, fame, predestination, love, reality, lucid dreaming, and standup comedy, to name just a few. To tackle these subjects, Stark offers the reader Ellen Gregory, a thirty-something standup comic turned TV superstar whose recent run-in with a murderous stalker leaves her questioning everything about the world she’s grown used to. That her world consists largely of hype and rumors only complicates matters for the increasingly cagey celebrity. Ellen’s Hollywood narrative alone would certainly provide enough material for a provocative examination of fame and its trappings, but Stark sweetens the deal by adding virtual reality to the mix. Shortly after escaping from the confines of her successful sitcom, Ellen falls for a computer programmer whose experiments have opened a doorway into a mysterious dimension that isn’t quite real but is, in some ways, more real than real. When Michael falls prey to a vicious attack, Ellen’s world turns upside down, and her entire world — not to mention her sense of self — goes up for grabs. Stylistically, Stark’s writing evokes a diverse range of contemporary authors. From the more “literary” camp, there’s Jennifer Egan and Don DeLillo, while the elements of science-fiction present in the novel call to mind William Gibson’s interest in virtual reality and Jamil Nasir’s examination of lucid dreaming in The Houses of Time. Complex, ambitious, and genre-bending, The Final Appearance of America’s Favorite Girl Next Door is a philosophical page turner that dares to ask what it means to really know someone. There comes a time in all our writing lives when our babies grow up. They are done spitting up at us and wetting the bed. They have gone through the hormonal, teen angst phase. It was rough, but we all go through the late night scream fests…the staying out all night…talking on the phone and the internet until school time is all done. Even the drunk college years are all done. Our writing is ready to start applying for “real jobs”. But how do we organize the “job search”? This is something I struggle with. The only time I remember who I sent my work to is when they send me the rejection letter. I know that’s horrible. I don’t suggest anyone do that at all. AT ALL. Because seriously, what happens when someone does take my work and I have to go around searching for the other places I sent my work to? It’s a hassle. A mess. But it’s a new year. I can’t keep doing the same thing, the same way and thinking I’ll get a different result. What I’ve decided to do is use an excel spread sheet to organize my writing. Each piece of work has its own spreadsheet. When the story gets rejected, I move down to the next block in the excel sheet and send my piece to that magazine. I bring this up because as writers, we need to learn the business of writing. Creating a piece isn’t the hard part; it’s dealing with the constant rejection. I’m hoping with this new mindset and this new organization approach, I can take out the sting of rejection. How do you organize your submissions? There is a ton of advice on how to edit and revise your work. Basically, I feel like every genre dictates how I go about cleaning up my own word vomit. With poetry, I start looking at verbs first and then changing my watery nouns to concrete, strong nouns. Then it’s time to play with punctuation. After that, I look at the end words and make sure they pack a punch. Plays…well, I start with the second ACT first. I make sure that ACT is sharp as a tack. Then I start rebuilding the first ACT. Short stories…. That’s a bit more difficult. It really depends on what the main problem is with the story. I tend to fix the bigger things and then start working on the words and phrasing. I say this because I’m interested in how others attack their word vomit. It’s a new year and that means everyone is thinking about how this year will be different from last year. As I’m wriitng this blog, I’m eating a chocolate covered pretzel (even though watching my weight is one of my New Year’s Resolutions. The good news is I only ate one. I could have devoured the whole bag. I didn’t. Progress). I also want to set better writing goals for myself. This generic, let’s get published this year, isn’t going to cut it. The goal is too vague and way too big. What do I define as published? Does self-publishing count? How about blogs? If I put something on facebook, does that count? See, too many questions. This year needs to be about progress. No looking back. No comparing myself to others. This year, it’s about me my writing only. I’ve decided to make monthy goals for myself. It will center around the things I can control, like the product, and less about the ultimate goal of getting something in print. For the month of January, my goal is to get another one act play written and work on my next full-length play. As opportunities for submissions come up, I’ll take them. However, this generic rejection after rejection is counterproductive. I’m a writer. Write, I shall. Anyone else have any writing goals for this month?